This Sun day’s reading is John 20.19-31, the narrative of the post-resurrection Jesus, in his transphysical resurrection body (see On the Resurrection for more on this term) appearing to the disciples in the absence of Thomas and then, a week later, appearing again in Thomas’s presence. This second event is known as the Incredulity of Thomas and is the subject of this famous painting by Caravaggio. As with the Easter Day reading from Matthew, here we have repeated by Jesus a two-stage statement of calming the disciples (“Peace by with you”) followed by sending them (“As the Father has sent me, so I send you”/”Blessed are those who have not yet seen and yet have come to believe.”) I would contend that implicit in this expectation of people who had not seen at the time that Thomas saw coming to believe is the direction to him (the you here in Greek is singular) that he goes and tells – he is incorporated into the direction given a week previously to the other disciples. Thomas’s commissioning in this way is preceded and predicated on his declaration in verse 28, “My Lord and my God!” In this declaration, the writer of this Gospel presents Thomas to us not as one who doubts (I cannot abide the term Doubting Thomas for Mr Didymus) but as one whose Jewish belief is being reshaped and redefined through the life, death and resurrection of Jesus. The phrasing of Thomas’s declaration is key to understanding this, the first recorded time that the name “God” is directly addressed to Jesus. Thomas declares, ho kyrios mou kai ho theos mou. This is a first-person application of a phrase that occurs frequently in the Septuagint, kyrios ho theos (eg, in Genesis 2.16 – rendered in English translations as the LORD God). This is itself a translation of the Hebrew YHWH Elohim. YHWH is the covenant name of Israel’s God and would be pronounced, adonai meaning Lord to avoid saying it directly – as such in both Greek and English translations it is rendered as kyrios or LORD. Elohim is the Hebrew word translated god or God (or, indeed, gods) in English. Why does this matter? It matters because firstly, Thomas is presented as declaring that in Jesus is to be found the fullness of Israel’s God, the Creator, the One God. The Shema, the famous declaration of Hebrew faith states, “Hear, O Israel: the LORD our God, the LORD is one.” (This is the same grammatical construct as above.) Yet here, that One God, is declared to be fully present in a human being. Paul also reframes Jewish faith as expressed in the Shema through Jesus and the Spirit but Thomas is presented as being the first to do so – and in Jesus’ physical (or, transphysical!) presence. Secondly, Jesus does not admonish him for this declaration, neither do any of the other disciples and nor does the writer say that he was mistaken or misguided. The declaration is allowed to stand unchallenged. All the actors in this scene are presumed to be in agreement, as well as what we would now call the omniscient narrator. Thirdly, he applies the declaration to himself, “the Lord of me and the God of me!” Jesus’ Lordship, his divinity is seen to have a direct impact on Thomas himself. 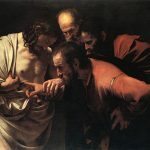 He does not even need to accept the invitation to touch the wounds (even if Caravaggio shows him doing so), Jesus is his Lord and his God. So what of us? What is the relevance of this for us? Well, we are among the people referred to by Jesus who have not seen (with our physical eyes as Thomas did) and yet are able to believe. We are invited to be part of the people of the One God and to encounter him through the risen and ascended Lord and God, Jesus. On this hangs all the declarations that subsequently flow in the New Testament, of Gentile believers being ingrafted into the vine of Israel for example – because the person in whom we put our trust is the one in whom all the fullness of Israel’s God was pleased to dwell (as in Colossians 1.15-23 for example) in order to reconcile all things to himself. In that sense, we are the intended audience referred to at the end of the passage – these things have been written so that we may believe that Jesus is the Messiah, the Son of God and that be believing, we may have life in his name. I am deeply indebted to N.T. Wright for the insights around Thomas’s declaration.